From HH's great range of outdoor technical apparel comes this classic casual rain jacket - the Junior Dublin. The Junior Dublin (Temple bar stag nights) is a smart, simple yet stylish jacket made with waterproof, breathable Helly Tech fabric with taped seams, full length front zip with stormflap. Other features include, elastic bottom hem cord, two lower pockets, and adjustable Velcro cuffs. So durable, even Little Jimmy couldn't break it! 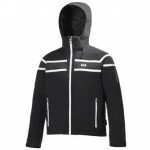 Helly Hansen Junior Dublin Boy's Waterproof Jacket (40073).